Question: What do you get when you mix a bunch of junk with Western Washington University Industrial Design program students, professional event production staff from the College of Fine & Performing Arts? Answer: The 2013 Trash Fashion Show at W.W.U..
View our photos from the trash fashion show with behind-the-scenes dressing room shots as well on Flickr. Designs included gowns and bodices made from discarded rubber, plastic, paper and metal materials. Bicycle and computer parts, electrical conduit, and old VCR tape were turned into skirts, pants. Caution tape and vinyl upholstery became haute couture. All of these designs were created in two short weeks as an assignment from Arunas Oslapas. Arunas is the lead faculty member of W.W.U.’s Industrial Design program and long-time proponent of reclaimed materials . 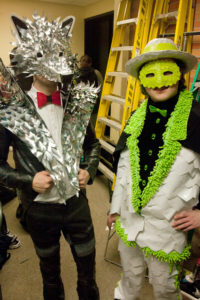 He has been assigning trash fashion design projects to his students since 2010. Those designs have been strutted on the fashion runway as a part of The RE Store’s Trash Fashion Show in 2010 and 2011. Arunas continues to innovate with reused materials. He is taking a sabbatical from teaching this spring to work with a Mexican village on developing products with reclaimed materials, designed by his students. We hope to get more of the story. We applaud WWU’s efforts to carry the torch of the Trash Fashion Show. The RE Store partnered on the event for many years, with Robin Worley, Ballard’s New York Fashion Academy, WWU and others until our final curtain in 2011. But the show has gone on, coordinated by Arunas and event production master Courtney Hiatt, the Marketing and Special Projects Manager for W.W.U.’s College of Fine and Performing Arts.